2018/19 BCIHL Championships: March 14-15, 2019 - Langley, B.C. Trinity Western University captured their second consecutive B.C. Intercollegiate Hockey League championship, sweeping a pair of playoff series after a first place regular season finish. In the first round, the Spartans picked up 6-3 and 5-2 victories over their Lower Mainland rivals from Simon Fraser University. And in the Finals, Jarrett Fontaine scored with seconds left in Game 1 to give TWU a 3-2 win before they closed out the series with a dominant 9-1 performance. Evan Last led the postseason in scoring with four goals and six points in four games. 2017/18 BCIHL Championships: March 15-16, 2018 - Langley, B.C. Trinity Western University captured their first B.C. Intercollegiate Hockey League championship, capping a dominant season with a finals series sweep over Selkirk College. In the first round of the playoffs, the Spartans bounced the University of Victoria in two straight games and exacting revenge after the Vikes shocked TWU with a stunning Finals comeback in 2017. The trio of Evan Last, Jarrett Fontaine and Jordan Rendle combined for 28 points in TWU's four postseason games, while BCIHL all-time wins leader Silas Matthys ended his BCIHL career with a championship he richly deserved. 2016/17 BCIHL Championships: March 17-20, 2017 - Langley, B.C. The University of Victoria pulled off perhaps the most thrilling and dramatic championship win in league history. After sweeping Selkirk College and Simon Fraser University respectively in their first round series, TWU and UVic faced off in a Finals that went down to the wire. Tied 1-1 with less than two minutes remaining in a decisive Game 3, UVic scored to move ahead 2-1. But a shorthanded reply from the Spartans a minute later tied the game, setting up UVic's Shawn Mueller to score the championship winner with just seven seconds left in regulation. It marks UVic's fourth BCIHL title. 2015/16 BCIHL Championships: March 18-19, 2016 - Castlegar, B.C. 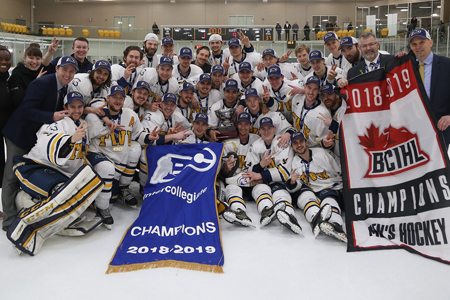 Selkirk College continued to cement their dynasty, sweeping Trinity Western University for the second time in three years to capture their fourth consecutive BCIHL championship. The Saints were pushed to the limit in their first round series vs. UVic, dropping their first-ever home playoff game before rallying for a Game 3 victory. 2014/15 BCIHL Championships: March 13-14, 2015 - Castlegar, B.C. Selkirk College became the first BCIHL team to earn a championship three-peat after entering the playoffs as the league's second-ranked team. The Saints beat third-seeded UVic in the opening round of the playoffs before sweeping SFU in the finals for the second time in three years. 2013/14 BCIHL Championships: March 14-15, 2014 - Castlegar, B.C. Selkirk College became the first team to repeat as BCIHL champions since Simon Fraser University won back-to-back titles in 2010 and 2011. The Saints swept fourth-seeded Thompson Rivers in the opening round of the playoffs before toppling a Trinity Western University squad that upset local rivals SFU to reach their first Finals since the league formed in 2006. 2012/13 BCIHL Championships: March 15-16, 2013 - Nelson, B.C. For the first time in 2013, the B.C. Intercollegiate Hockey League determined its champion via a traditional playoff format. Selkirk College won their first league championship after posting a league-record 21-3 record in the regular season, as the Saints swept UVic and SFU in their two postseason series. 2011/12 BCIHL Championships: March 14-18, 2012 - Kamloops, B.C. The University of Victoria captured their third BCIHL championship in six years with a thrilling 4-3 overtime win over the top-seeded Simon Fraser University Clan to wrap up a cinderella run at Memorial Arena in Kamloops. 2010/11 BCIHL Championships: March 23-27, 2011 - Burnaby, B.C. Simon Fraser University captured their second consecutive BCIHL title with a 5-2 victory over the Thompson Rivers University WolfPack on their home ice at the Bill Copeland Sports Centre. 2009/10 BCIHL Championships: March 18-21, 2010 - Langley, B.C. Chris Chan and Jas Rai scored third period goals to lead SFU to a come-from-behind 2-1 victory over Thompson Rivers University at the Langley Events Centre. The championship in the second in three years for SFU. 2008/09 BCIHL Championships: March 13-15, 2008 - Abbotsford, B.C. The University of Victoria won its second championship in three seasons, topping regular season frontrunner SFU by a 3-1 score. Simon Fraser University captured its first league title by defeating the University of the Fraser Valley by a 3-0 score. The University of Victoria capped its unbeaten 2007/08 season with an 8-3 victory over the University-College of the Fraser Valley to capture the 2007 BCIHL Championship.